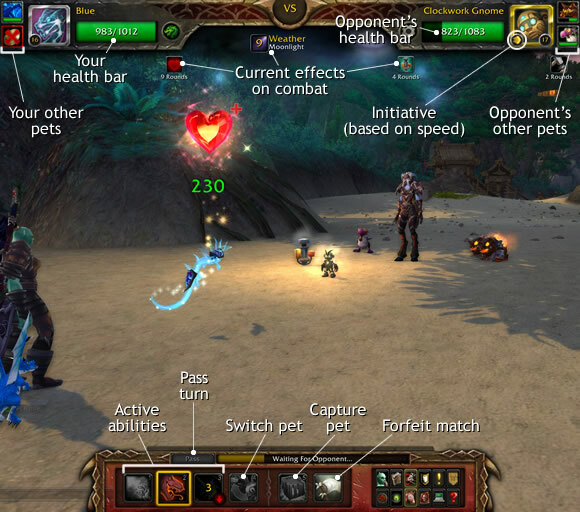 WoW Pet Battles are a new type of turn-based mini-game within World of Warcraft. 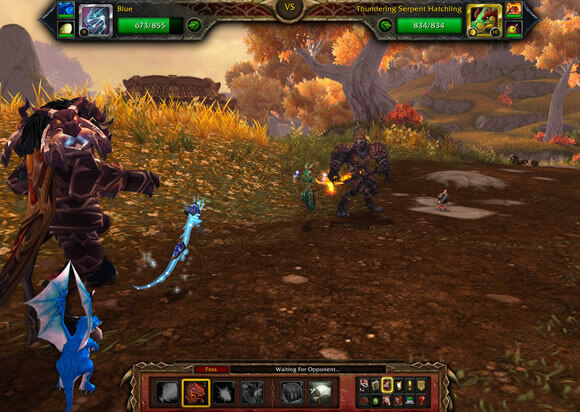 Pet Battles allow players to raise their companions’ level (up to level 25), capture wild pets, and even battle other players' companions. Here some of our favorite Pet Battle resources. We're always expanding these resources, so check back often! You can calculate the battle stats of any pet (at any level and rarity) by checking the "Battle Info" tab in the pet profiles found right here on WarcraftPets. These profiles are full of valuable information and community comments. To get started on becoming a pet battling master, seek out a Battle Pet Trainer in one of the lower level starting zones or in Stormwind or Orgrimmar. Trainers will teach you Battle Pet Training for 10 , as well as how to Track Pets on your minimap. The level requirement to receive Battle Pet Training is level 5, and once you've learned how to battle on one character, all your other characters will also receive the training. 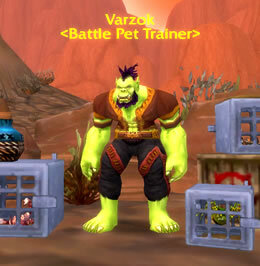 In addition, the Battle Pet Trainer can teach you a race-specific pet if you don't already have it in your collection. However, the trainer will only offer to teach you the pet that is designated for your race. Here's a full list of each race's trainable companion. Note that many of these pets are also available from vendors located in or nearby faction capitals. After training the Pet Battles ability, the first slot in your Pet Battles team will unlock. To have an active pet on your team, you'll need to select a companion from the list in your Pet Journal, and drag it into the first space under Battle Pet Slots. You can unlock the other two slots by completing the achievements Newbie and Just a Pup. But before you head off to conquer the critter and companion world, you'll need to speak with your trainer again. The trainer will start you off on a short quest chain that will teach you the ability Revive Battle Pets. This spell is essential, as it’s the most convenient way for you to heal and resurrect your wounded and fallen pets. Once you've learned how to heal your companions, you're pretty much all set to take on the wild world of Azeroth and beyond! The ability to track wild pets will allow you to see which critters are capturable and which aren't. If you have the tracking ability selected for your mini-map, a green paw print will show up if a wild pet is nearby. This same icon will also appear above a critter if it is a pet you can battle and catch. When you've chosen a wild pet you would like to battle, right click on the critter and it will take you into a unique Pet Battle UI. You can't engage a Pet Battle if you are in combat, and any attack from a player or nearby creature will remove you from the Pet Battle. TIP: Be sure that the area in which you start the battle is a fairly flat and clear spot. If there are large objects obstructing the area, such as a house or a large boulder, you won't be able to begin the battle. Likewise if there isn't enough ground space. The Pet Battle combat UI will show you your active pet's abilities, your opponent's health, stats, quality and abilities, and there will be options for you to switch pets, pass a turn, capture a pet or forfeit the match. The golden border and the 'speed' mini-icon surrounding a pet's portrait indicate its initiative (i.e., whether it will be the first to use an ability or attack each round). Initiative is based on a pet's speed, and if this stat is higher than your opponent's, you will be designated to go first. Each slot has two spell options, and you can switch abilities in each, but only before and after your pet battles—not during. To switch an active ability, click on a pet's active slot in your Pet Journal, and a select which ability you'd like your pet to use from the drop down menu. TIP: Your pets won’t gain as much experience when you capture an opposing battle pet rather than kill it. Keep that in mind if you’re looking to level your pets quickly. Higher level wild pets are often accompanied by more than one critter in battle. Only after beginning the battle will you be able to see any accompanying pets on their team. To win the battle, you will need to defeat (or capture) all of the opposing battle pets, even the newly joined ones. After each Pet Battle, any injured companion will automatically regain 50% of the damage that was taken during combat. But if any pets on your team are severely low on health, or worse... dead... you have a few options. The Revive Battle Pets spell (icon pictured at left) will be the primary way to heal your companions and resurrect them. Clicking it heals and resurrects all of your pets in your Pet Journal, including your active team. This ability can only be used out of combat and has an 8 minute cooldown, so use it wisely. FYI: Both the Revive Battle Pets ability and the Stable Master's heal are put on a 3 minute lock-out at the moment you log in. This is to prevent players from rapidly switching back and forth between characters to use these healing abilities on pets since the cooldown is not shared between characters. Heal spell on cooldown? Can't seem to find a Stable Master? Well, you're in luck because there's yet another way to heal your companions! The Battle Pet Bandage is the third way to heal and resurrect your pets. It's a random drop from the Sack of Pet Supplies that you can obtain by defeating NPC Pet Tamers. It functions in the same fashion as the Revive Battle Pets spell, but it doesn't have a cooldown. TIP: Battle Pet Bandages are bind-on-account so you can move them between all your characters. Additionally, they are stored in stacks of 25. Every pet family has its own strengths and weaknesses, as well as a passive bonus. This information is helpful to know so you can plan stronger attacks against pets who are vulnerable to them, and defend against pets whose attacks are strong against your pet type. The table below shows which pets families are strongest or weakest versus other families. Strong attacks receive a 50% damage increase (base dmg x1.5) while weak attacks suffer a 33% damage penalty (base dmg x0.66). The chart below (created by Khlammy) provides a make-shift "cheat sheet" that includes the info in the table above. TIP: Get our Pet Battles Cheat Sheet, providing you with a printable version of the chart above. It's a great quick-reference while you play. Each family conveys a passive bonus to pets of that type. These bonuses can have a significant impact on the outcome of a Pet Bettle under the right circumstances. Along with general families, pet abilities are also categorized by type. In most cases, a companion will have spells that correspond with its family type, but some pets will have unique abilities that fall under a different group. Most of the PVE battle pets you face in the wild can be can be captured. To capture a wild pet, you will need to bring its health down to less than 35% and then use the Trap ability once it lights up. Note that using this will take up your turn for the round. In addition, you may only capture one companion on a team of wild pets, so choose wisely! CAUTION: If your goal is to collect a wild pet, be careful not to kill it! Remember, your objective is to drop it below 35% health. So avoid using any strong attacks against the wild pet when it drops below 50%. Not all the pets that join a wild pet's team will be capturable. However the majority of them can be trapped. The best way to determine whether or not a pet can be caught is by checking for it in the Pet Journal. If the pet isn't listed, it likely can't be captured. There is always a chance that your trap will fail. The good news is that the chance of failure drops with each additional attempt. In some situations, a failed trap might mean you need to bring the wild pet's health down again for it to be eligible for caging. FYI: Completing certain achievements will reward upgraded traps which will help to increase your chances of a successful capture. Engaging a wild pet in battle will phase you out of the environment, and the wildlife in the immediate area will not be visible to you. This doesn't mean you will be invulnerable during a Pet Battle session, though. Participating in Pet Battles will not automatically flag you for PVP on a PVE server. Only PVP zones such as Tol Barad or Wintergrasp will flag you for player versus player combat. On PVP servers, everyone is fair game! Your trap may fail a few times before you finally claim your prize, so be persistent and patient… you’ll get there! Each wild pet you capture will have its own random set of battle stats dependent on its quality and breed. The next section covers pet quality in greater detail and we feature another guide on our site dedicated to breeds and breed IDs. You’ll also notice that pets of certain levels will "weaken" after being captured. A level 16 to 20 wild pet will lose 1 level when caught. A level 21 to 25 pet will lose 2 levels when caught. CAUTION: If you are unsuccessful in battle, any wild pet you managed to trap during the fight will be lost. So remember, in order to receive any trapped pet, you must win the overall battle. If you happen to trap the first opponent on a wild pet team, but lose the match against the second critter, the first pet will be lost and you will have to try again with another wild pet. Pets with [epic] and [legendary] qualities are not yet accessible to players (as of Patch 5.1). But Blizzard has stated they fully intend to implement them in the future. FYI: A few of the highest level Master Tamer NPCs have pets of epic and legendary quality. There are also a few legendary pets that are objectives for the Beasts of Fable daily quest. However, there’s no way for you to capture any of these pets. These different qualities affect a pet's battle stats. The higher the quality, the better its health, speed and attack values. These values will also scale better as you level your battle pet. Stats can vary even if two pets share the same rarity. For example, one uncommon quality cat might have more health but less power and speed, while a second uncommon quality cat has less health but more power and speed. This is because each of these cats could have different breeds. You can learn more about breeds and breed IDs here. Curious about the actual formula used to calculate each pet's battle stats? See the Calculating Stats Based on Breed section of our Guide to Pet Breeds. Battle-Stones were introduced in patch 5.1 as a new item that can be used to automatically upgrade your pets directly to [uncommon] quality (via Polished Battle-Stones) or [rare] quality (via Flawless Battle-Stones). General Battle-Stones can be used to upgrade any pet to the quality designated by that stone. These are bind-on-use and may be traded to other players. Family-specific Battle-Stones may only be used to upgrade a pet of the corresponding family. These are bind-on-pickup and cannot be traded away. TIP: Using a Battle-Stone on a pet level 15 or higher will cause the pet to automatically lose 2 levels. Keep this in mind, as you'll want to relevel that pet before you engage in any difficult battles. Battle-Stones can be found in the Tamer daily reward bag, or randomly awarded to you after defeating a wild pet in battle. There's also a small chance to earn one by defeating a player in a queued PVP match. Defeating a higher level pet increases your chances of getting a stone. Polished Battle-Stones can be purchased for 1,000 Justice Points. Additionally, the trainers in Stormwind and Orgrimmar will trade one Marked Flawless Battle-Stone in exchange for three of a kind family-specific Flawless Battle-Stone. Pet breeds are used to determine the primary stats ( Health, Power, Speed) of your battle pets. So if you want to maximize your pets' fighting potential, understanding how breeds and breed IDs work is crucial. Check it out to learn everything you need to know about breeds! For more information on each Pet Tamer and the complete quest chain, take a look at this post in our forums. If capturing wild pets and fighting against NPCs isn't really your thing, then try out Pet Battles PVP-style! Through the Pet Battles queue. By challenging a player to a Pet Battles duel. The Pet Battles queued match is the way to go if you’re interested in leveling your pets—winning a queued match will earn your surviving companions experience, whereas winning a Pet Battles duel will not. To battle against a randomly chosen player and their team of companions, simply hit the Find Battle button in your Pet Journal. The queuing system will attempt to match your team up with an opponent's team of similar level. Additionally, during a queued Pet Battle you will not be able to speak with your opponent or see their name, realm, or guild. You won't be able to capture any of their companions either. But let's be honest, the main focus is the battle between pets — may the best tamer win! With over 250 wild pets to find and capture, it's not unlikely that your collection will soon feel bloated and cluttered. There are a few ways to organize your collection, but there are also some restrictions to keep in mind. The maximum number of total pets you can own is 1000 pets (this includes any duplicate companions). You can only have 3 of any one pet (and only 1 of certain pets). Once you reach this cap, you won't be able to add anymore of that specific pet to your collection until you remove one from the journal. So what can you do to make sure your collection is neat and tidy but falls under these rules? There are two ways to rid your Pet Journal of unwanted duplicates: releasing and caging. The first way to clean house (or barn, in this case) is to release any extra pets. 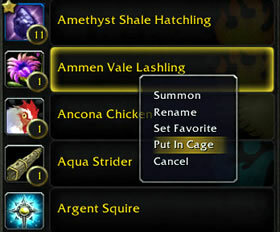 To do this, right-click on a minipet's name in your journal, and select the "Release" option in the menu. Doing so will remove this pet from your collection. Certain hard to obtain pets and promotional companions will not have the release option unless you've reached the duplicate cap (x3) for that specific pet. This is to help prevent any accidental removal of unique and rare companions. The second option is to cage a pet. You can accomplish in the same way you release one. After caging a companion, it will appear in your inventory. It will retain its stats and level, and this information will be visible when hovering over the item. These caged versions can be traded and sold. They would make great gifts too! Keep in mind that for the time being, wild pets cannot be caged. 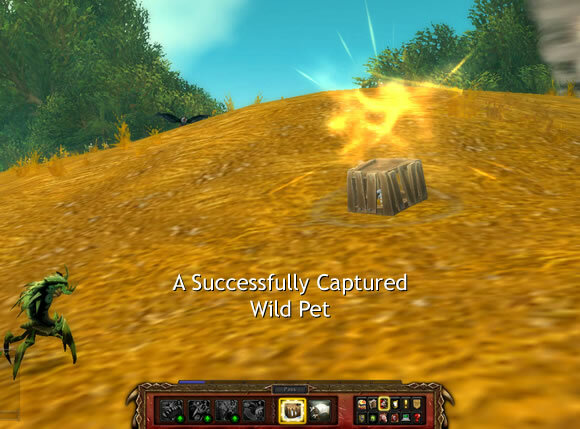 Blizzard developers have expressed concern involving the trade and sale of wild pets, and until a resolution can be implemented, wild pets can only be released. It's not clear if and when we will be able to cage wild pets. Here are some general tips and strategies to consider when participating in Pet Battles. Level up more than one team of 3 pets. You can sub out injured companions with other pets of similar level when your Revive Battle Pet spell is on cooldown. 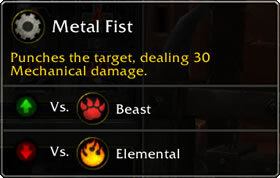 Early on, it can be quite advantageous to level a mechanical pet and a beast pet as two of your primary battle pets. You'll run into a ton of beasts and critters at the lower levels, and mechanical is strong against beasts while beasts are strong against critters, allowing you to level more quickly. Some pet battle abilities persist through multiple rounds. These can buff your own pets or debuff your opponent's. Use these abilities first to get the most out of them and pave the way to victory! Remember to switch companions during a battle. If a pet on your active team doesn't participate in the fight, it won't receive any experience. You can earn player experience by Pet Battling. Non-level capped players will earn a small amount of experience when battling wild pets that are within 5 levels of their highest level pet on their active team. Review your Pet Battle combat log after a battle to gain a better idea of what worked each round. You can select the option to view Pet Battle Combat in the chat box settings. Right click on the General tab → Settings → Other tab → Check Pet Battle Combat. Capture as you go. By capturing companions as you progress through pet levels, you'll be adding higher and higher level pets to your collection. This will save you some time since you won't have to start from level 1 with your new additions. Some wild pets are quite rare and have long respawn times. Others have special conditions and will only show up when those conditions are met. Be patient, they will appear eventually! If you're looking to catch a specific wild pet but can't find any in the area, enter battle with another pet native to that zone. The companion that you're seeking might show up as the second or third team member. Defeat the team and capture your prize! Level capped players have a chance to earn Lesser Charms of Good Fortune from successful battles. The opponent must be within 5 levels of their highest level pet on the active team. Pet resilience applies to both PVP and PVE encounters. A pet that has been recently affected by crowd-control (such as a stun), will be granted immunity to further crowd-control for 2 rounds. Be careful when purchasing high level companions from the Auction House or other players. You can only add a pet to your collection if its level is equal to or less than your highest level pet.